Dogs have been used in law enforcement since the Middle Ages. Wealth and money was then tithed in the villages for the upkeep of the parish constable's bloodhounds that were used for hunting down outlaws. [clarification needed] In France, dogs were used in the 14th century in St. Malo. [clarification needed] Bloodhounds used in Scotland were known as "Slough dogs" - the word "Sleuth", (meaning detective) was derived from this. One of the first attempts to use dogs in policing was in 1889 by the Commissioner of the Metropolitan Police of London, Sir Charles Warren. Warren's repeated failures at identifying and apprehending the serial killer Jack the Ripper had earned him much vilification from the press, including being denounced for not using bloodhounds to track the killer. He soon had two bloodhounds trained for the performance of a simple tracking test from the scene of another of the killer's crimes. The results were far from satisfactory, with one of the hounds biting the Commissioner and both dogs later running off, requiring a police search to find them. 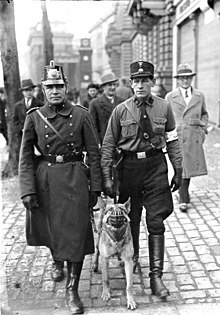 Training of police dogs is a very lengthy[clarification needed] process since it begins with the training of the canine handler. The canine handlers go through a long[clarification needed] process of training to ensure that they will train the dog to the best of its ability. First, the canine handler has to complete the requisite police academy training and one to two years of patrol experience before becoming eligible to transfer to a specialty canine unit. This is because the experience as an officer allows prospective canine officers to gain valuable experience in law enforcement. However, having dog knowledge and or training outside of the police academy is considered to be an asset, this could be dog obedience, crowd control, communicating effectively with animals and being approachable and personable since having a dog will draw attention from surrounding citizens. For a dog to be considered for a police department, it must first pass a basic obedience training course. They must be able to obey the commands of their handler without hesitation. This allows the officer to have complete control over how much force the dog should use against a suspect. Dogs trained in Europe are usually given commands in the country's native language. Dogs are initially trained with this language for basic behavior, so, it is easier for the officer to learn new words/commands, rather than retraining the dog to new commands. This is contrary to the popular belief that police dogs are trained in a different language so that a suspect cannot command the dog against the officer. Dogs used in law enforcement are trained to either be "single purpose" or "dual purpose". Single-purpose dogs are used primarily for backup, personal protection, and tracking. Dual-purpose dogs, however, are more commonly trained. Dual-purpose dogs do everything that single-purpose dogs do, and also detect either explosives or narcotics. Their training is tough and requires being able to distinguish different kinds of drugs while avoiding getting blinded if another smell takes over. These dogs could smell narcotics even if one were cooking steak right next to them, making them an effective detection dog. However, they cannot be trained to detect both. Dogs can only be trained for one or the other because the dog cannot communicate to the officer if it found explosives or narcotics. When a narcotics dog in the United States indicates to the officer that it found something, the officer has reasonable suspicion to search whatever the dog alerted on (i.e. bag or vehicle) without a warrant. Apprehension and attack dogs - This dog is used to locate and subdue suspects or enemies. Search and rescue dogs (SAR) - This dog is used to locate suspects or find missing people or objects. Belgian Malinois, German shepherds, Golden retrievers, Labrador retrievers, and Bloodhounds can all be used. Detection or explosive dogs - Some dogs are used to detect illicit substances such as drugs or explosives which may be carried on a person or in their effects. Many police dogs are trained to detect marijuana, heroin, cocaine, crack cocaine, and methamphetamines. Some breeds are used to enforce public order by chasing and detaining suspects either by direct apprehension or a method known as Bark and Hold. Dogs such as the Belgian Malinois have many qualities that make them applicable for the job. Belgian Malinois are superior for working because they’re fast, agile, and have an incredible work ethic. A successful dog should be intelligent, aggressive, strong, and have a good sense of smell. 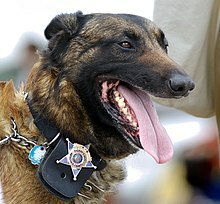 Many police dogs that are chosen are male and remain unneutered to maintain their aggressive behavior, however there are female police dogs which are used for rescue, tracking, and locating bombs and drugs. Belgian Malinois are most commonly used because of their availability. Police dogs are retired if they become injured to an extent where they will not recover completely, pregnant, or raising puppies, or are too old or sick to continue working. Since many dogs are raised in working environments for the first year of their life and retired before they become unable to perform, the working life of a dog is 6–9 years. However, when police dogs retire in some countries they may have the chance to receive a pension plan for their contribution. Police dogs in Nottinghamshire, England, now have the opportunity to retire with a form of security since their government forces now offer $805 over the span of three years to cover any additional medical costs. Not only do they now receive a pension plan but they also get to retire and reside with their original handler. If these dogs are killed in the line of duty they get the same honors as their human partners. Canadians started using police dogs occasionally in 1908. However, they used privately owned dogs until 1935 then the Royal Canadian Mounted Police (RCMP) saw the value of police dogs and created the first team in 1937. Many Canadian municipalities use dog squads as a means of tracking suspects. Most municipalities in Canada employ the bite and hold technique rather than the bark and hold technique meaning once the dog is deployed, it bites the suspect until the dog handler commands it to release. This often results in serious puncture wounds and is traumatic for suspects. A dog has the legal status of property in Canada. As such, developing case law is moving towards absolute liability for the handlers of animals deliberately released to intentionally maim suspects. The dog is effectively a weapon. There are a total of 240 active police dogs in Denmark, each of which are ranked in one of three groups: Group 1, Group 2 and Group 3. Dogs in Group 1 are very experienced, and highly trained. Group 1 dogs are typically within the age range of four to eight years old and are used for patrolling, rescue, searching for biological evidence and major crime investigations. Group 2 dogs are employed for the same tasks as members of Group 1, but they do not participate in major crime investigations or searching for biological evidence. Group 3 is the beginner rank for police dogs, and are only employed for patrol operations. The Police Dog Unit, (Abbreviation: PDU; Chinese: 警犬隊) established in 1949, is a specialist force of the Hong Kong Police under the direct command of the Special Operations Bureau. Their roles are crowd control, search and rescue, and poison and explosive detection. In addition, the PDU works in collaboration with other departments for anti-crime operations. The KLPD is just one of the 26 police regions in the Netherlands. Every other region has its own canine unit. For example, the canine unit of the regional police Amsterdam-Amstelland has 24 patroldog handlers and six specialdog handlers and four instructors. The unit has 24 patroldogs, three explosives/firearms dogs, three active narcotic dogs, two passive narcotic dogs, two scent identifying dogs, one crime scene dog and one USAR dog. They work on a 24/7 basis, every shift (07:00-15:00/15:00-23:00/23:00-07:00 local time), has a minimum of 2 patroldog handlers on patrol. The special dog handlers work only in the dayshift or after a call. In India, the National Security Guard inducted the Belgian Malinois into its K-9 Unit, Border Security Force and Central Reserve Police Force use Rajapalayam as guard dogs to support the Force in the borders of Kashmir. The Delhi Police has recruited many of the city's street dogs to be trained for security purposes. The Bengal Police uses German Shepherds, Labrador Retrievers, and the Indian pariah dog in its bomb-sniffing squad. Police dogs are in widespread use across the United States. K-9 units are operated on the federal, state, county, and local level and are utilized for a wide variety of duties, similar to those of other nations. Their duties generally include drug, bomb, and weapon detection and cadaver searches. The most common police dogs used for everyday duties are the German Shepherd and the Belgian Malinois though other breeds may be used to perform specific tasks. ^ a b Sen, Adrija (5 March 2019). "This Rescued Street Pup Is Now A Part Of The City's Elite Canine Squad". Times Internet. Retrieved 11 March 2019. ^ "How to Become a K9 Officer: Career and Salary Information". Criminal Justice Degree Schools. Retrieved 16 April 2019.